“Love others as much as you love yourself,” Jesus told his followers. These words are considerably more than a sugary Sunday School story. For those who take these words to heart, “love others” has profound, life-altering implications, not all of which are warm and fuzzy. Consider the life of Bernard Lichtenberg, arrested seven decades ago. His crime: He loved. Lichtenberg was a Catholic priest serving in Berlin before the outbreak of World War 2. When Adolf Hitler and the Nazi Party came to power, he recognized the coming terror better than most, and made it his ambition to help the Jewish people and other persecuted groups. Lichtenberg spoke and acted boldly in defense of the Jews, and his repeated protests quickly landed on the ears of government officials. Then, as he knew would be the case, these protests landed him in the crosshairs of a Gestapo investigation. After years of tension, Lichtenberg was finally imprisoned for his opposition. During his interrogation Lichtenberg was given the opportunity to recant his words and change his ways. He would not. Rather, he said: “I reject with my innermost the [deportation of the Jews] with all its side effects, because it is directed against the most important commandment of Christianity, ‘You shall love your neighbor as much as you love yourself’. “However, since I cannot prevent this governmental measure, I have made up my mind to accompany the deported Jews and Christian Jews into exile, in order to give them spiritual aid. I wish to ask the Gestapo to give me this opportunity.” Considered irredeemable by the Third Reich, Lichtenberg’s appeal was granted. He was condemned and consigned to the concentration camp at Dachau. Aged, frail, and in a weakened state, Bernard Lichtenberg died while waiting to be deported in November of 1943. 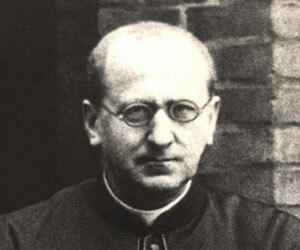 It is hard to say that Father Lichtenberg, almost single-handedly opposing the Nazi war machine, was acting in a reasonable or sensible manner. How could he, as one man, ever hope to achieve “justice” for the oppressed? What could one pulpit minister do to dismantle or otherwise deter such a system of death? Not much, except to be persecuted, imprisoned, or executed. No, Bernard Lichtenberg was not being practical. He was being love. Such love can appear like madness, leading the follower of Jesus into all manner of impracticality. Loving our neighbors as ourselves means we turn the other cheek when we are assaulted, we abandon the selfishness and power-grubbing ways of this world, we refuse to repay evil with evil, and we forgive others rather than retaliate against them. The problem is obvious: Loving and living like this will put us in vulnerable, seemingly defenseless positions. To willingly behave this way, in the “real world,” will only get us abused, maligned, taken advantage of, or worse. These “opportunities,” as Lichtenberg called them, clearly aren’t very pragmatic. Yet, pragmatism doesn’t seem to be Christ’s principal concern. We are instructed to love, following Jesus’ own example, not because it is practical, reasonable, logical, or the safest way to live in the world. We actively participate in this way of Jesus because it gives witness to the good and loving God of heaven. Not for a minute should we think that unselfishly loving our neighbors will save the world from all hate and violence. It won’t make our membership rolls at the church grow, get more people into the pews on Sunday, or achieve justice for all society. None of these are the point. We love our neighbors as ourselves not because it always “works,” but because it witnesses. Love for others is a clear reflection of the love of God – and that is the point. Pope John Paul recognized this decades later when he honored the martyrdom of Bernard Lichtenberg with these words. He said, “It is not the world’s applause but the faithful confession of Jesus Christ that is the sign of an authentic disciple of Christ.” This confession may not always “succeed,” but it will always shine as a light in the darkness.